Cutting through the noise to develop a smart campaign strategy can be the hardest part—but it’s also the most important. So, where to start? 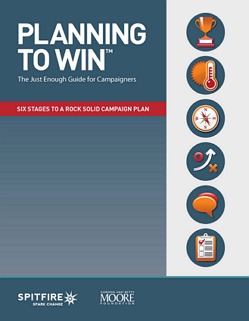 With the partnership and support of the Gordon and Betty Moore Foundation and input from dozens of campaign experts, Spitfire developed Planning to Win: The Just Enough Guide for Campaigners. This free online tool—a revised version of our popular Just Enough Planning Guide®—breaks campaign planning down into six steps. When finished, you will have a strategy to share with staff, board members and anyone else you need to put your plan into action. Designed specifically for foundations and nonprofits, the Smart Chart walks you through six logical steps to a truly strategic communications plan. If you have a goal, the Smart Chart can help you build a smart strategy to reach it. And if you don’t have a goal, the Smart Chart will help you get one—no, seriously, it really will. It’s been so widely received and successful, we even had it translated into Spanish. Smart Chart 3.0 is also available online, so that you can craft winning communications plans right away. If knowledge alone was enough to inspire action, the world would already be a better place. Real change requires action, and the key to moving people from knowledge to action is persuasion. 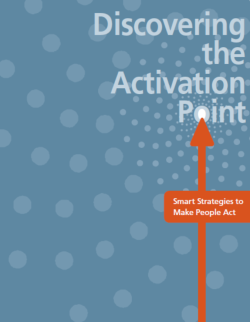 Welcome to the Activation Point™, where you will find best practices for planning for persuasion, tailored to the unique needs of social change organizations. The Activation Point is a publication of the Communications Leadership Institute™ and Spitfire Strategies™. 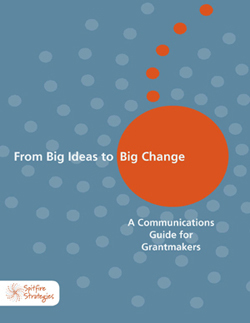 Big Ideas to Big Change™ is a report and planning tool that foundations can use to be clear and consistent when describing their change strategy to all important audiences. Foundations are committing more resources than ever before to communicating about their work and missions—yet grantees continue to give funders low marks when it comes to fostering a clear understanding of what the foundation is trying to accomplish and where they fit in. To address this gap, Spitfire Strategies developed From Big Ideas to Big Change. This report examines how foundations communicate about their change strategies and offers advice for effectively engaging foundation staff, grantees and other audiences in communications efforts that succeed in turning a vision of change into reality.